New collection! 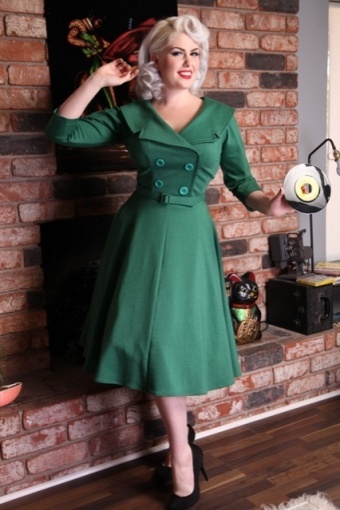 The Secretary Cirkel Dress Dress green 3/4 sleeve from Bettie Page Clothing Our most popular style is now available in green! Perfect for Fall and winter! Class, elegance and versitility at it's best! It can be worn anywhere...from work to a party. Made of quality stretch jersey that is soft, not scratchy. It can be worn with a crinoline (as shown on the pics, in our oponion model Doris is wearing it too short, our petticoats are the perfect height) for a fuller flare effect or without. Beautiful fifties details, like the double breast, wide collar, wide sleeves. Metal zipper closure down back. Comes with small fabric belt. Great products, quick delivery and frienly as well as efficient customer service. perfect.Als de zomer dan al niet wil...laat de herfst dan maar komen..ik ben er klaar voor.